Texas Moratorium Network (TMN) is a non-profit organization with the primary goal of mobilizing statewide support for a moratorium on executions in Texas. TMN undertakes various educational and outreach projects and works closely with other groups devoted to human rights and criminal justice reform, including other non-profit organizations, churches and synagogues, civic organizations and student groups. Significant death penalty reform in Texas, including a moratorium on executions, is a viable goal if the public is educated on the death penalty system and is encouraged to contact their elected representatives to urge passage of moratorium legislation. We hope that you will join us in this fight for fairness and social justice. Please join our email list and become one of the more than 20,000 people in our network. You can also find us on Facebook, Twitter, Flickr and YouTube. Delia is fighting to exonerate her brother, Louis Castro Perez, who is on death row in Texas. 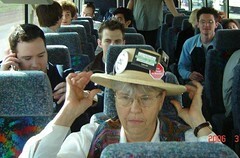 Jeanette Popp was Chairperson of Texas Moratorium Network from 2001 to 2004. In March 2009, Jeanette published a book with Wanda Evans entitled “Mortal Justice: A True Story of Murder and Vindication”, which can be bought on Amazon. Jeanette’s daughter Nancy was murdered in Austin in 1988. Jeanette became intimately familiar with the many flaws of the Texas criminal justice system after two innocent men were wrongfully convicted of her daughter’s murder and spent 12 years in prison. They were exonerated and released in 2001. 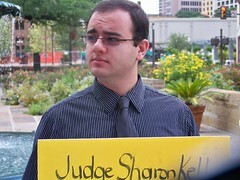 The real killer was convicted in October 2002. Jeanette successfully pressured the District Attorney not to seek the death penalty for her daughter’s murderer. Jeanette’s riveting testimony in 2001 helped convince two Texas legislative committees to vote in favor of moratorium legislation. 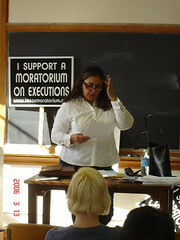 She frequently travels across the nation speaking out against the death penalty. 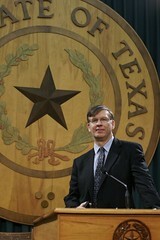 Texas Moratorium Network is organized as a 501 (c)(4) social welfare organization. Donations to Texas Moratorium Network are not tax-deductible, because TMN’s primary purpose is to lobby for a moratorium on executions.